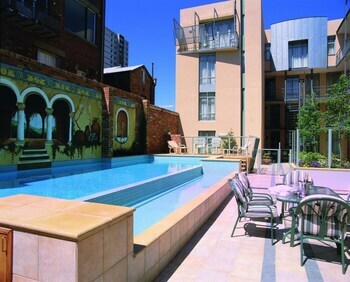 Located in Fitzroy, Melbourne Metropole Central is in the business district, a 4-minute walk from St. Vincent's Hospital and 6 minutes by foot from Melbourne Museum. Featured amenities include dry cleaning/laundry services, multilingual staff, and luggage storage. Event facilities at this hotel consist of a conference center and meeting rooms. Free self parking is available onsite. When you stay at Jacaranda Cottages in Witta, you'll be 15 minutes by car from Maleny Botanic Gardens. Free self parking is available onsite. With a stay at Noosa River Sandy Shores in Noosaville, you'll be within a 10-minute drive of Noosa Marina and Noosa National Park. Free self parking is available onsite. Allawah Bendigo offers accommodations throughout the area in Bendigo. Free self parking is available onsite. With a stay at Loddon River Motel in Kerang, you'll be a 3-minute walk from Kerang Museum and 5 minutes by foot from Riverside Park Sports Reserve. Free self parking is available onsite.